The farm here is flat, with a pretty nasty hardpan, so when a friend mentioned Hugelkultur we were keen to try it out. Basically they are a type of ‘mega raised’ beds, made from whole tree trunks and wood waste rounds covered with a thin layer of topsoil. Over time the wood decomposes, feeding the plants growing up top, all that carbon holds onto a massive amount of water too, so we’ll get better moisture levels for our trees too. Sounds like a win-win, which is our goal here at the farm. 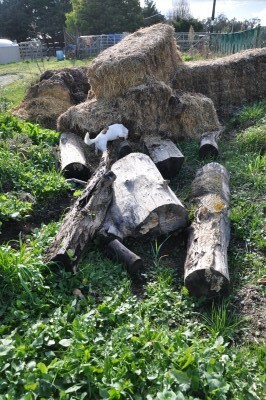 We have a few old felled poplar here which weren’t any good for firewood. 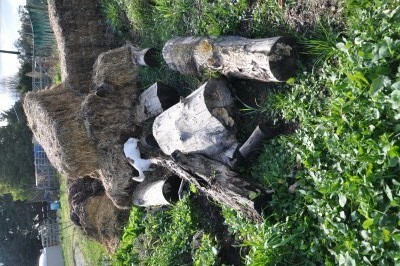 Being a white wood, they are the ultimate for growing fungi. Two years ago we had a building company drop off some ‘topsoil’ which we planned to use to plant some food and shelter trees into. Alas the ‘topsoil’ was mainly clay and more of the hardpan materials we have here already, boo. So the pile has sat unused covered in weeds. We have dug out the centre of these mounds with a little digger, dropped in some waste poplar, tomorrow we let the pigs in. Everything here gets the pig treatment, so thats what the waste straw is for. They’ll gobble up alot of the straw looking for bugs, it’ll add roughage to their manure, and they’ll spread the straw around for us. and we’ll cover it with the soil materials in the next week. We’ll keep you updated with how our experiement progresses.